"The spirit, achievements, goals and ideals of those now deceased are kept alive in the memory of the living. That is our legacy and we are obligated to pass it on to our children." -- Muriel Nelson Beroza. 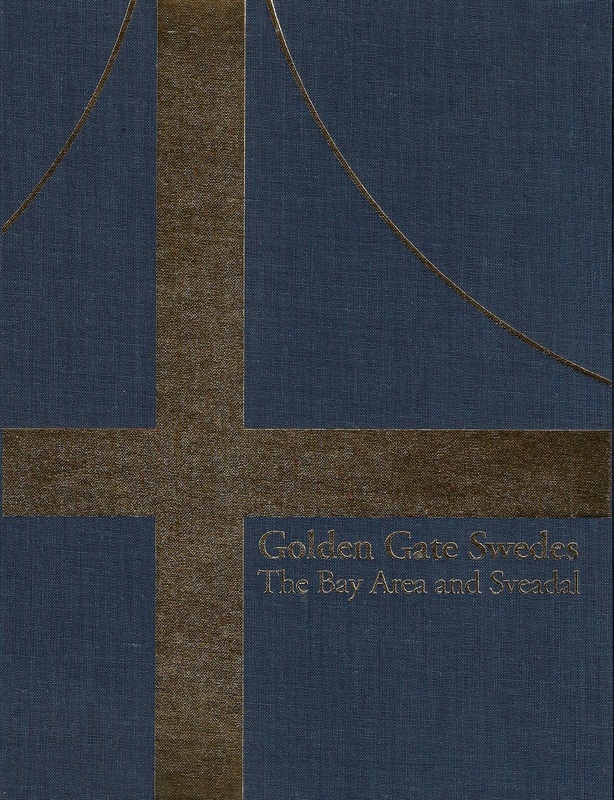 Golden Gate Swedes: The Bay Area and Sveadal. Range of Light Works, 2000. Although addressed to the San Francisco Bay Area Swedish American community, “A Final Word,” the last chapter from author Mrs. Muriel Nelson Beroza’s wonderful book published in 2000 titled Golden Gate Swedes: The Bay Area and Sveadal, resonates nationwide, with Swedish American communities, who share similar feelings and sentiments and, like her, are continually working toward restoring, preserving and promoting the remnants of the past Swedish America for the generations that follow. "This modest reflection upon the achievements of the San Francisco Swedes is far from complete. I have felt almost presumptuous to have taken on this task. It has been a very enjoyable one. The people about whom I have written are the immigrants and their descendants. This ambitious and steadfast group has preserved and cherished their Swedish heritage against all odds, even with dissenting voices from within. "The Sweden that we American-born Swedes remember is frozen in time. It is that time when our parents, grandparents or great grandparents left Sweden to come to America. The Sweden that we know and love is from that time distantly past. For most of us it is Sweden from about 1880 to perhaps 1930. The Sweden of that time was more pastoral and not the industrialized nation that it is today. We cherish the old folk songs, dances, and the traditions that have perhaps faded in Sweden a bit, but remain strong in our hearts. The stories and songs that we heard at our parents’ knees were of those days, the hardships and adventures, the sorrows and the joys. I have heard recent visitors from Sweden say that we are more Swedish than the Swedes. It is certainly true that we are more “old fashioned” Swedish than the recent immigrants. The newcomers now from Sweden are fluent in English, well educated and affluent. They are more modern than we are and are probably nonplussed by the quaintness of our dual heritage. It is such a wonderful thing to have the culture of two enchanting countries to cherish. "It is doubly enriching for us and for our children to hold both our own country and Sweden so close to our hearts. Sveadal has become a very special place. It was created by this Swedish immigrant colony of the San Francisco area. The spirit, achievements, goals and ideals of those now deceased are kept alive in the memory of the living. That is our legacy and we are obligated to pass it on to our children." Go HERE to Sveadal Midsummer 2018, originally created by the Swedish immigrant colony of the San Francisco Bay Area. All color photography throughout SwedishAmericana is by Fran Cochran unless otherwise indicated. Copyright © 2019 www.swedishamericana.org All rights reserved.